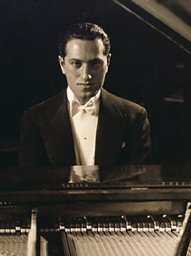 A combination of the elements of jazz and folk with traditional symphonic compositions is considered to be a unique musical approach of Gershwin. The first attempt of such creative experiment was his opera 135th Street, which, indeed, was not very successful. But the next work in the framework of this “mixed” style, The Rhapsody in Blue (1924) for piano and orchestra caused shock in American musical world. Despite of a certain lack of proper form and numerous repetitions, this composition was an example of exceptional vivid rhythmic and melody. Also, it included a bouquet of American national tunes, that is why it become one of the most popular compositions of all American concert works. The next symphonic work was Concerto in F (1925), which marked a new era in Gershwin’s experiments with jazz and swing. The concerto has innovative musical concept, and till today it remains matchless with its emotionality. Soon, Gershwin created a sort of symphonic dance, named An American in Paris (1928). This work can be called a “symphonic poem”, with its unique wideness of blues melodic and emotional development of harmonic connections. Gershwin’s fundamental symphonic masterpieces were not just a combination of tunes, but large indivisible works of art. Gershwin was among the first composers, who tried to base their works on improvisation and developing repetitions of the principal tunes and melodies. Undoubtedly, ballad folk-opera Porgy and Bess (1935), written on the novel by DuBose Heyward Porgy, was the peak of Gershwin’s artistic career. It is one of the first attempts to present various problems and daily life of ethnic minorities in American culture. This masterpiece has the most mature music of the composer. BEsides, it is the best and most successful American opera of all times, though it received different reviews of critics after its premiere in New York. The opera includes a number of Gershwin’s life-best compositions: Summertime, Bess You Is My Woman Now and I Got Plenty of Nuttin are three most known of them. In 1937 Gershwin started feeling terrible headaches and doctors diagnosed brain tumor. In summer of 1937 he passed away. He was only 39, and he forever remained in minds of American people as an outstanding musical innovator, who created a new style of American music, which we all know today. Beautiful songs written by George Gershwin can be heard in more than 90 movies and TV Series. Some of his stage musicals, like Girl Crazy, and his opera Porgy and Bess were published as different TV versions, and a great number of his songs were borrowed by cinema sound directors to express emotional moments of their movies. In 2004 Gershwin’s song I’ll Build a Stairway to Paradise became a part of soundtrack for Oscar nominated movie The Aviator. Being a brilliant composer, Gershwin gained good fame as a talented pianist. After his piano performances, hundreds of enchanted spectators used to rise up and applaud for 20 minutes. He played all the premier performances of his own works, and also he gave a lot of concerts, playing music of other composers. His performances were exceptionally emotional, sincere and exciting, and he could make any boring composition live and breath with his expressive playing. 37 processes generated in 0.213 seconds.